Leshanow: "The City that never sleeps" ha "The City of a thousand Minarets"
Cairo (Arabek: لقـــاهــرة al-Qāhira) yw an brassa sita ha pennsita Ejyp. 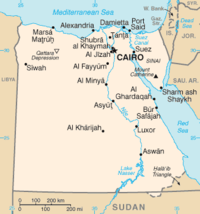 Yma a-dro dhe 7,947,121 a dus ow triga yn Cairo. Diwettha chanj an folen ma a veu an 10 Gwynngala 2018, dhe 22:51.